By popular demand, Otakuthon, in collaboration with Helios Makerspace, is proud to present the Cosplay Repair Room! What is the Cosplay Repair Room? The Cosplay Repair Room is a space where cosplayers can repair their cosplays for free using equipment provided by Helios Makerspace. 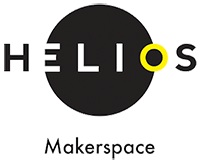 The helpful and knowledgeable staff from Helios Makerspace will be there to help and support any cosplayers in need of a touch up. What will be in the room? Everyone is welcome to use the Cosplay Repair Room for repairing their cosplays. Please remember this is a repair room, not a rest area.